Of all the bands where you can search for "Radio Nature", the place of honor goes to the very low frequencies below 100 Hz. And the magnetic component of these signals certainly is the most interesting part: here we can find signals directed to submarines, Schumann resonances, geomagnetic pulsations caused by solar storms and, perhaps, the seismic radio precursors. An induction coil, also called search coil, is the prohibited dream for every "Radio Nature" researcher. They are available in commercial versions but the costs are very high: many thousands of Euros / Dollars for the coil and special receiving device. Let's see together how to build one with professional features for use with our sound card, but, spending far less money. The induction coil is nothing more than a multiturn loop and works with the same principle: there are many turns, a variable magnetic field passes through them, this creates a voltage across its terminals. In some loops we have no magnetic core and only mechanical support. Here we have a core material with high permeability, which virtually increases the efficiency and response of the loop/coils. The reasoning appears simple, however, if we attempt to calculate this type of sensor we realize that it is almost impossible. Even the texts of physics and research institutes indicate that an induction coil is almost impossible to model. Fortunately we can resort to experimental tests to arrive at excellent results. Why? The reason is: there are too many unknown, unsuspected, and interactive parameters. The first parameter that is difficult to calculate is the coil inductance. Even without considering the presence of a high permeability core, multilayer coils with thousand of turns are difficult to calculate. The final value of the inductor always has a different value from those calculated. The second unknown is the parasitic capacitance: it changes its value depending on how the coils are wound, with what order, with how many layers. Two induction coils with the same look, same number of turns may have very different parasitic capacitance values: it involves two different values of self resonance, for example: 500 Hz and 4500 Hz... for two quasi-identical coils! The third unknown factor is the representation of an equivalent circuit. With an air core loop, we can, with good approximation, reducing everything to some equivalent components: inductance, current generator, resistance and capacity. In an induction coil we have the capacity between the windings, capacitance between the layers, the capacity between the sections, distributed resistance and mutual induction is not constant between all of these. The model presented in the picture does not accurately simulate the approximate behavior of the induction coil as it should. The fourth and most serious unknown factor is the magnetic permeability of the system: we have to use a core with permeability much higher that the air to increase the effective capture area. However, full effect of the high value of the permiability is only realised with a closed magnetic circuit, as in a toroid. In an induction coil the core is open, which means that the effect is very small if compared to original permeability and there are considering the losses. If we use a ferrite rod with a relative permeability of 1000 we will not have an increase of the capturing area and the inductance of 1000: the final value will be much lower and will depend on the permeability of the bar used, the length and diameter of the same. These two values are called "rod permeability" (or µ rod) and "coil permeability" (µ Coil) and, as if that were not enough, are not equal! Here is an example with real numbers: one induction coil with a core with µr of 500 (taken from the ferrite data sheet) could have a µ-rod of 70 (inductance increasing) and a µ-coil of 30 (capture area increasing). There are formulas to calculate these values, but also they are only approximate. Now you understand now why an induction coil is a difficult product to design? And perhaps this is the reason why they are so expensive. The best results are obtained with high permeability cores. The best choice would be mu-metal or permalloy. But they are very expensive and difficult to find. We therefore opted for ferrite: there are many types and sizes, so there are many choices. Also the choice of the length/diameter ratio is very important: it must be as high as possible because the rod-µ and µ-coils are heavily dependent by this value. For ferrites like the one we chose, it must be at least 25 for a good coil efficiency. The numbers and the choices that follow are the result of calculations and measurements made on different materials. They are a good compromise for an efficient coil and not too expensive. We have chosen to use the rectangular section ferrites used in power transformers, composing a bar with the assembly of several pieces. The material chosen was the code I93/28/30 3C90 by FERROXCUBE: the value of µi for this product at low frequencies is about 2300. They are high permeability blocks of size 3 x 2,8 x 9,3 cm. The core of the coil is composed of 10 blocks and its final size is then 93 cm in length with a square section of 3 x 2,8 cm. The length / section is therefore approximately 29 times, big enough to give a good capture area. In the left picture see a single ferrite block and a test coil. 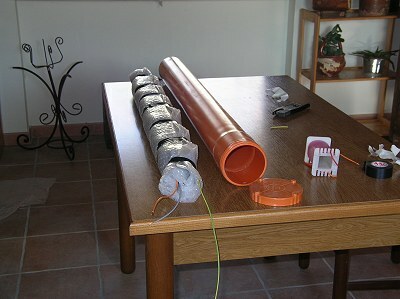 The final results, following the instructions that will be provided for the coil, are as follows: µ-Rod (ferrite reception gain) 158 times, and µ-Coil (ferrite inductance increasing) 71 times greater. These measured values indicate how large a change in the coil performance is achieved by adding the ferrite core. Both parameters are important: the µ-Rod will be useful to estimate the number of turns and µ-Coil to know the impedance and therefore properly design the preamplifier. The winding will occupy 8 of the 10 ferrite blocks, leaving the two ends free. This is useful since the value of µ-coil decreases as you move away from the center of the bar. The two core elements at the ends add to the total µ-coil but carry no windings. In addition, the winding must not be done in a single layer. It must be broken into sections: this helps to decrease the parasitic capacitance by raising the self resonance frequency. Ferrite blocks are readily available worldwide from large distributors of electronic components such as RS-Components. The cost of each ferrite block is approximately € 20.00. 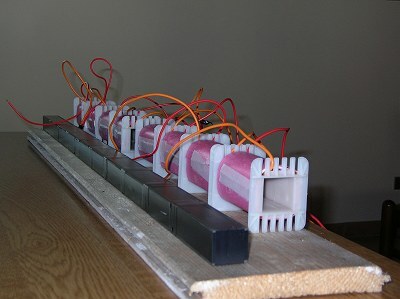 The blocks are assembled together using a bicomponent glue. The joints are reinforced with high strength adhesive tape, in a longitudinal direction at each joint and along the entire length of the bar. It is necessary to be careful at this stage. The built bar is very delicate and can easily break. The ferrite material is very brittle and if it breaks, or falls, it splits into a thousand crumbs, as if it were made of glass. To build the winding we have approached manufacturers of transformers: and they have wound 8 spools with 12.000 turns each. They fit perfectly with the ferrite cores and give to the construction a very professional end result. Each winding is wrapped approximately with 0,33 kg of copper wire (2,5 kg for the entire induction coil) and the cost realized in this way is Euro 55,00 each section for a total of Euro 650,00 (10 ferrite blocks + 8 wound sections). With such high values of impedance the assembly of a shield is not just a possibility but is a necessity. If the induction coil is not shielded it will be sensitive to the electric field and the quality of the reception will be compromised. We can use a grid of thin metal to shield the sensor, like the one used to make anti-mosquito grid for windows. This material is readily available at hardware stores. 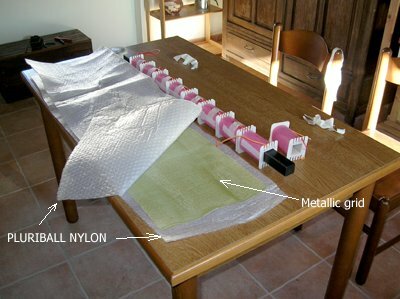 Before being installed the grid must be isolated: I got the insulation by mounting the moschito grid inside of two larger sheets of nylon bubble. The isolation is necessary because it is essential to make sure that the ends of the metallic net are not touching. Otherwise they form a single loop, a net metallic tube, that would work as short-circuit loop, lowering the sensitivity of the coil. The shield must cover the entire object, windings and ferrite bar: with high impedances ferrite rod is coupled capacitively to the windings becoming itself an electric field sensor. If you do not believe it try to to touch the ferrite with a finger: you will see the hum noise output from the coil to increase immediately, as if you were touching an oscilloscope probe. The first stage design is very important for the final result of the coil: it is very easy to lose tens of dB in signal /noise ratio if this stage is not optimised. We have chosen a balanced type configuration with a virtual short circuit: we tried different configurations, but this is the one that gave the highest immunity to pick-up of the electric field. It is very important because the impedance of the coil is very high, so it is very likely that the electric field together with the magnetic field is received. To avoid this in addition to screening with the grid we have chosen this type of configuration: the electric field signals arrive in a common mode to the amplifier and are then rejected. The coil works then in current mode. The gain of the first stage has been chosen to be about 55 dB below 1 Hz, 12 dB at 100 Hz and reaching the unity gain at 400 Hz : it is determined by the ratio R1 + R2 resistors and the coil impedance. This ensures that the entire operating range from 0,1 to 100 Hz output overrides the input noise of the operational noise input of the next stage. 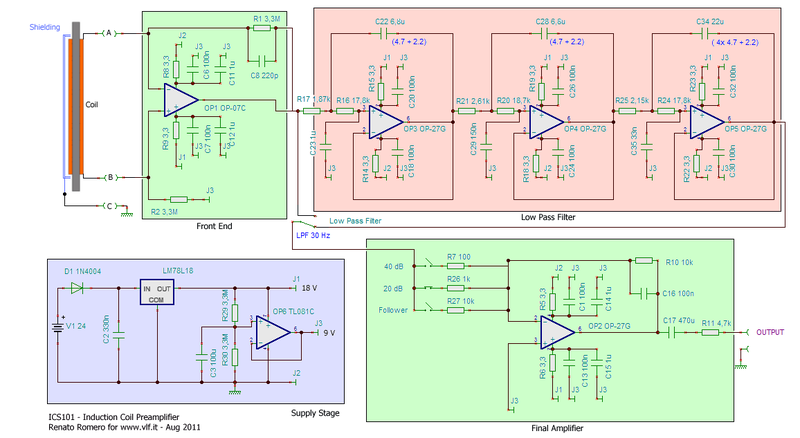 At the same time it is not so high as to require offset compensation and in any case is tolerated in terms of product gain for bandwidth by the operational amplifier. The choice of the operational amplifiers has been very laborious. The first selection was made based on values of voltage noise and current noise indicated in data-sheet, considering their effect on the coil impedance. The following amplifiers were taken into consideration: OP27, OP07, TL071, AD820, AD743, AD797, OP97 and LT1113. Unfortunately, many documents do not report data below 10 Hz. For a low noise performances in the available data sheet were the best the AD743 and OP07. Testing them we found that the first is better at 10 Hz, while the latter works better under 1 Hz. For this reason we decided to install in a first stage an OP07: choosing to give advantage in the coil performances to frequencies below 10 Hz. Finally the capacity of 220 pF C8 introduces a low pass filter at about 220 Hz, to avoid signals at higher frequencies saturating the stage generating artifacts of measurement below 10 Hz. The low frequency corner is instead determined by the inductance of the coil and its intrinsic resistance: it is a low pass filter at 1,3 Hz. A second pole is given by the output capacitor of the amplifier circuit. However, they are not a problem because under 1 Hz natural radio signals grow in intensity: this compensates for loss of sensitivity, giving a quasi-flat response. It can be very useful, especially in environments where 50 or 60 Hz are very intense, to ensure that the natural background and the highest level of hum noise are both included in the dynamic range of the sound card. Its main function is then to lower the level of hum noise, leaving the lower frequencies to pass undisturbed. For this reason the filter must be very steep and so we chose a 6 pole Chebychev filter configuration : with it you have 44 dB of attenuation at 50 Hz by placing the low frequency corner to 30 Hz. Chebychev configuration was chosen because the final low pass filter is steeper, even if it shows a slight ripple on the frequency linearity. We have chosen a Sallen-Key circuit because it uses fewer parts and simpler. 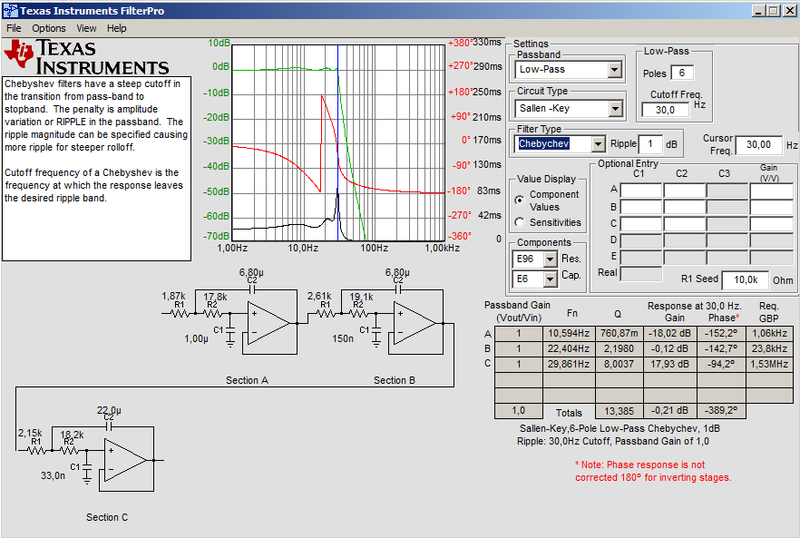 The design of the filter was performed with the freeware software of Texas Instruments "Filter Pro". Here below the screen configuration with the end result. We rejected the idea of the notch filter: difficult to produce and especially difficult to maintain a stable frequency with changes in temperature (do not forget that the coil operates usually outdoors, with temperatures that can range from +40 ° C to - 30 ° C). The frequency of notch filter, especially if very narrow and sharp, would be influenced by temperature. The 22 and 6,8 µF capacitors used in the three sections of the filter must not be polarized. 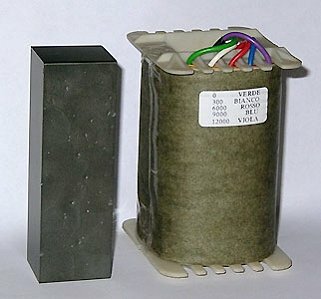 This means that you need to use polyester capacitors connected in parallel to reach the value shown. Do not make compositions with electrolytic connected in phase opposition: avoid these tricks. They do very strange things deforming low frequency signals. 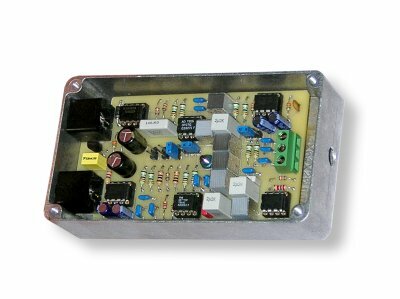 The final amplifier brings up the signal level to ensure that it is strong enough for any type of sound card. The goal of this amplifier is to make sure that the input noise enters the first stage in the dynamic window of the sound card: this way even the slightest signal received by the coil will also be displayed with your sound card. There are three selectable gains: the gain of 20 dB is usually the best and adapts to mostlocations and sound cards. If once turned on the coil the output signal exceeds 1 Vrms, you must insert the low-pass filter or reduce the gain. The maximum gain of 40 dB is recommended only in combination with the low pass filter or with sound cards of low gain. In my installation, where the coil is placed in the garden 30 m away from home, the low pass filter has been disabled and the gain is set to 20 dB. We now have all the data to estimate the sensitivity of our coil thus constructed. Let's take an example at 10 Hz. 0,3 pT / 0,04 pT = 7,5 corresponding to a margin of 17,5 dB. To make this measurement with the sound card we have to set the value of "equivalent noise bandwidth" to 1 Hz: it is different by the width of one FFT-bin. An example would be setting a sampling rate of 6000 S/s, 8192 FFT points and a "hamming" window of integration type. 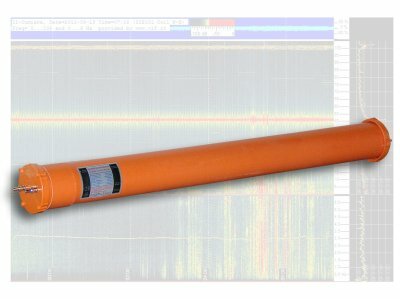 This will provide a value of 0,996 Hz equivalent noise bandwidth, suitable for our measure. You can also choose other settings to get this final value: SpectrumLab shows this value in the section "Configuration and display control / FFT proprieties". Now we have to measure the background noise of our acquisition device (soundcard). 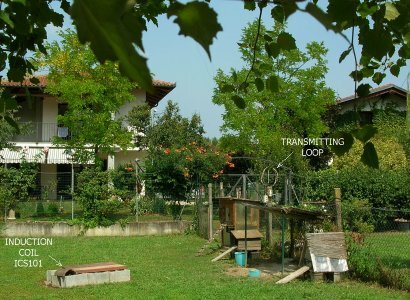 To do this, once the coil is positioned far from house and connected to a PC by a coaxial line we turn (ON) off the power: the spectrum we detect is related to the input noise floor of our soundcard and all the noise coming from transmission lines we use to carry the signal from coil in the gardento the PC in the house. Now we need to measure the noise of the preamplifier, but it varies with frequency because the inductor is not linear and varies its impedance: it changes so the value of noise generated by the current noise of the IC and changes the value of the operational amplifier gain. We need to realize therefore three resistance of 13,1 kOhm, 138 kOhm and 1,43 MOhm: these simulate the impedance of the coil at frequencies of 1, 10 and 100 Hz. We connect these resistors, instead of the coil, one by one, switching on the preamplifier with gain set to 20 dB and each time we read the values of noise in FFT curve at 1, 10 and 100 Hz. These three points will give the noise floor of our amplifier when it is fed by the coil. We can also do this for others but these three points are sufficient for an overview. With these three points we draw a curve that is the noise floor of our preamplifier. Now we connect the preamplifier to the coil and test the strength of received signals. They must be at least 15 dB above the noise curve traced before. If we achieve this result our device is sensitive enough. But to know "how much" it is we have yet to make a test: transmitting a known signal strength. 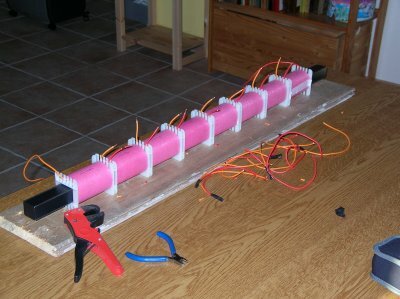 To do this I built a transmitting loop with 40 turns of diameter 45 cm. The loop was placed 4.5 m from the coil, at 1.9 m height. In series is with the loop is a 1000 Ohm resistance connected to a function generator. After that signals are transmitted at various frequencies a floating oscilloscopeis used to measure the voltage across the resistance to then obtaining the current flowing in the loop. With this information, applying the law of Biot Savart we can calculate the field generated by our loop at a certain distance. Calculator for Off-Axis Fields Due to a Current Loop, by Eric Dennison. As we can see the sensitivity obtained is very similar to that calculated and at some frequencies even better: the gap between the noise floor (yellow line) and the received signal (blue line) is always maintained above 15 dB. A second graph was made focusing on the lower part of the spectrum: the most critical part being below 3 Hz. Here too the results are very good: our device is quite capable of receiving the geomagnetic pulsations. With these measures we are now able to evaluate the quality of our construction by comparing it to the specifications of a professional product used for research. We chose the model of MGC-3 Meda: it is a tool used by many research centers and reported on many academic papers. Here is the chart that compares the characteristics in the region of Schumann resonances. Two references were taken: the minimum signals detected by Maxell / Stone in their famous paper and signals detected in the daytime in our monitoring station, which obviously are stronger. The graph shows the signals expressed in dBpT: 0 dBpT correspond to 1 pT, 20 dBpT to 10 pT, -20 dBpT to 0,1 pT and so on. In this second picture we see how our coils behave in the most difficult region of geomagnetic pulsations frequencies, under 6 Hz. This is valid from 1 to 300 Hz, with the preamplifier gain set to 20 dB and the low pass fiter turned off. Final results: what can we really get with this coil? The initial goal was to build an induction coil able to receive the Schumann Resonances and geomagnetic pulsations with a soundcard: let us see how it has been observed. . The coil, as described above, was placed in the garden, 30 meters away from the house and power lines, and positioned to receive the North-South direction. 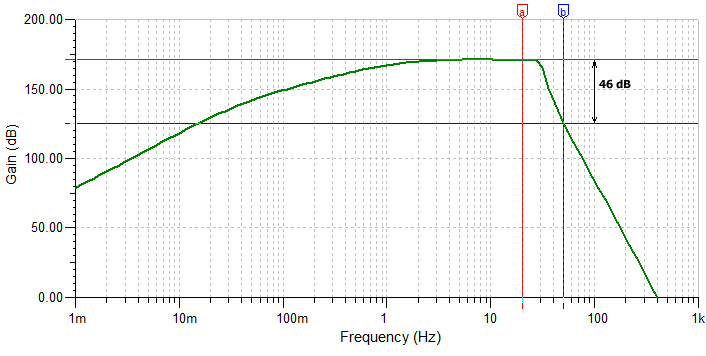 The low pass filter, after the characterization, has been activated and the gain set to 20 dB. The output signal from the coil was directly connected to the LINE input of a standard type Creative sound card. 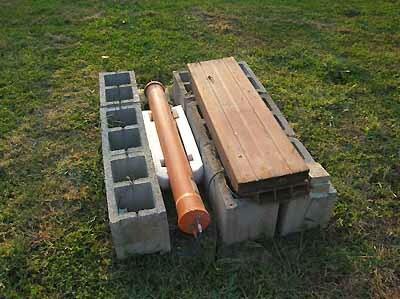 The coil was immobilized with the hard foam packing between some cement blocks. This reduces the transmission of vibration of the soil by limiting the effect of microphonics. The coil is then covered to prevent falling rain from producing the same effect. 4 hours of NS reception during the 2011 summer. Acquiring software SpectrumLab, analyzing software: Sonic Visualizer. Here we can se a good PC1 geomagnetic pulsation. It extends from 0,8 to 1,2 Hz and it emerges from the background noise some times by more than 15 dB. Schumann resonances are also clearly visible. Our coil is doing a good job! 6 hours of NS reception during the 2011 summer. Acquiring software SpectrumLab, analyzing software: Sonic Visualizer. 8 hours of NS reception during the 2010 summer. Acquiring software SpectrumLab, analyzing software: SpectrumLab with unattended programmed grabber. The signal SRS is much stronger than in the previous example. According to a lot of documentation that is available on the web they would be due to the fluctuation of the magnetospheric tail under the influence of the solar wind. They would be a direct consequence of the Alfven resonance. 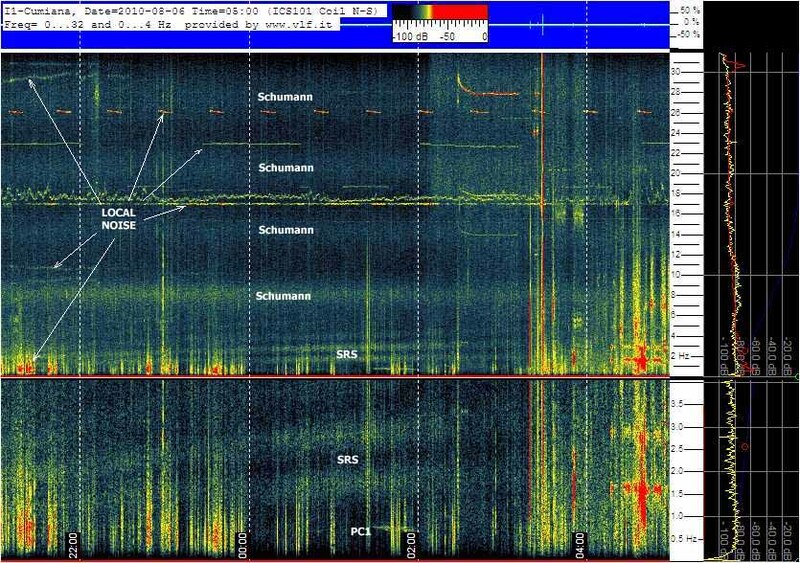 Also are visible in the spectrogram Schumann resonances and a weak PC1 pulsation. Our coil works just fine! In the spectrogram are also present many non-natural signals. They come from the power supply in my house and by a high voltage power line just 1 km away from here. They unfortunately are not excludable with the low-pass filter because are located at lower frequency. The only way to avoid them is to find a place sufficiently free from low frequency electromagnetic pollution. a) Microphone effect. The coil also functions as a microphone: it hears the footsteps, the passage of vehicles and thunder. A geophone positioned near the coil can help to distinguish true signals from false signals. b) The disturbance of the earth's magnetic field. 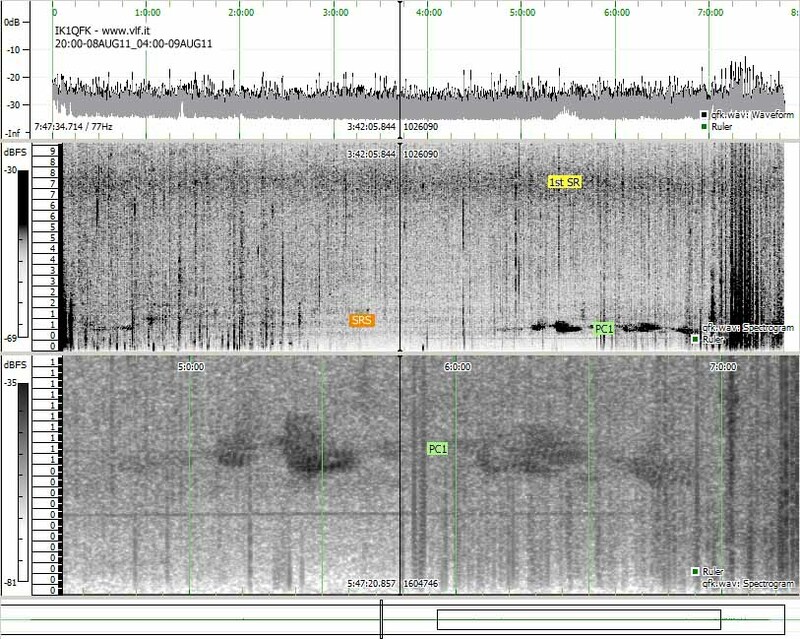 It can be disrupted by any ferromagnetic metal object that moves close to the coil: just a bunch of keys to rotate a few feet away, and their track appears on the In the spectrogram. This also means that the coil must not be near where the metal parts that can vibrate, like fences or iron gates. Even the passage of cars causes of changes in the magnetic field within ten meters away. c) Local sources. 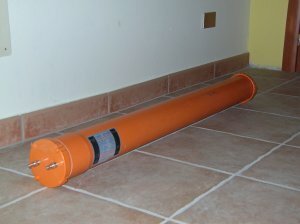 The coil should be located away from local ELF sources, such as: electric motors, pumps, washing machines, generators, charge controllers for solar panels, tube lamps, dimmer, CRTs,TVs, computers and any type of switching power supply. d) Main power interharmonics (or Main power AM modulation) : Many signals arrive from the power supply: they are caused by non-linear loads that modulate in amplitude the network current. Many of these signals appear just like an AM modulation: for example you can see signals similar to PC1 at 1,5 Hz but are also present to 98,5 to 101,5 Hz. They are certainly not geomagnetic pulsations. To discover they sometimes need to run several spectrograms of the same signal at different FFT resolutions: this allows you to highlight details and find which are false signals. 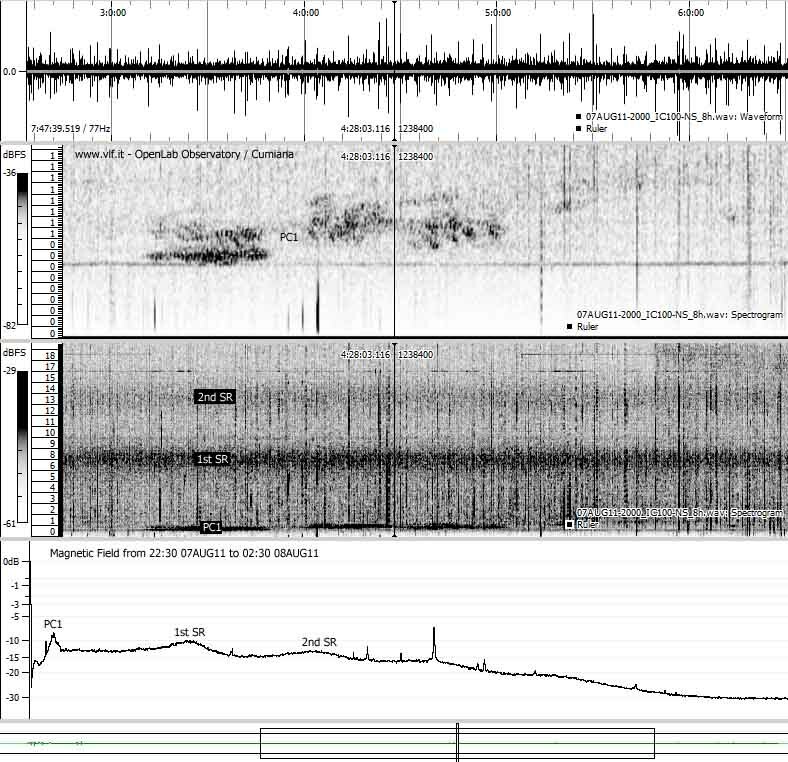 See for example the page of the observatory of Cumiana (http://www.vlf.it/cumiana/livedata.html) where the region of frequencies below 30 Hz is examined simultaneously in different ways: at high resolution with slow scrolling and with faster scrolling in multistrip graph. There we have done it: we have built an induction coil with professional specifications, using as acquisition device a simple sound card. Now we too can receive similar geomagnetic pulsations such as HAARP . Many Thanks to: Claudio Re for support during testing, advices and project documentation, Marco Bruno for advices and equipment provided, Andrea Dell'Immagine for various suggestions and the idea to use rectangular ferrites, Dave Ewer for grammar correction. Land Induction Coil (LIC) 120 data sheet, KMS Technologies - KJT Enterprises Inc.
MGC-3 AC Magnetic Field Sensor data sheet, MEDA, Inc.